This Jordanian photograph or Applied Art which was created on or before December 31, 1974, is currently in the public domain in Jordan because Article 32 of Copyright Law No. 22 of 1992 was amended by Law No. 29 of 1999 to provide for a 25-year term of protection for photographs starting January 1st of year of completion. Although this provision was later repealed by Law No. 78 of 2003, the repeal did not renew the copyright of photographs which had already fallen into the public domain, because Article 7 of the 1992 law explicitly disallows such retroactive protection of out-of-copyright works. Or, by Article 7 section a, it is a photocopy of Jordanian Laws, Regulations, "Daily news published, broadcast or communicated to the public", Court orders or Official governmental documents or Official translation of any of the above or any part of it. In order to be hosted on Commons, all works must be in the public domain in the United States as well as in their source country. 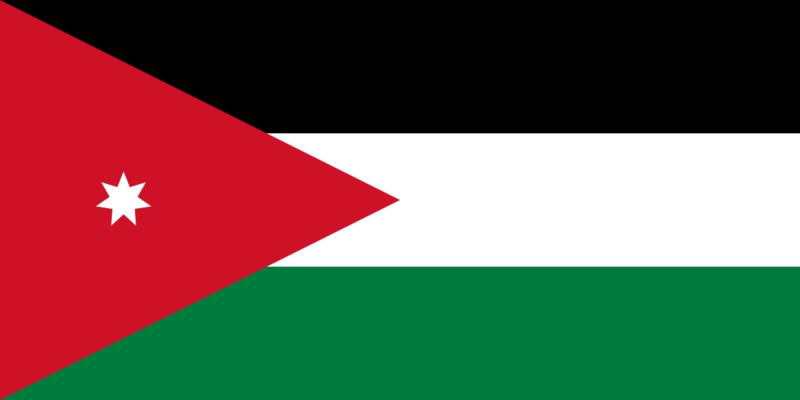 The copyright of all pre-1975 Jordanian photographs had expired in Jordan on the U.S. date of restoration (July 28, 1999). Such photographs are thus currently in the public domain in the United States. رائج الوقت 17:13، 4 جنوری 2019ء 1,000 × 500 (442 بائٹ) FDRMRZUSA Reduced size (compressed). 15:28، 4 جنوری 2019ء 1,000 × 500 (2 کلوبائٹ) FDRMRZUSA Higher svg resolution from same file: resized by "Inkscape". Same proportion: 1:2. No other changes.